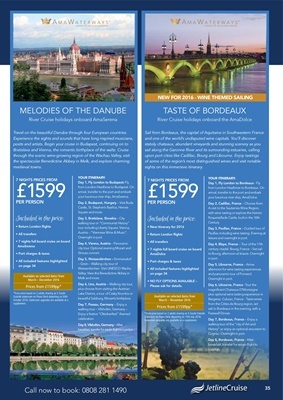 Travel on the beautiful Danube through four European countries. your luxurious river ship, AmaSerena. walking tour or "Communist History"
Austria - "Viennese Wine & Music". breakfast, transfer for return flight to London. sights on this immersive itinerary. your luxurious river ship, AmaDolce. leisure and overnight in port. and panoramic tour of Pomerol. stateroom on Piano Deck departing on 15th July 2016. Stateroom upgrades are available at a supplement.